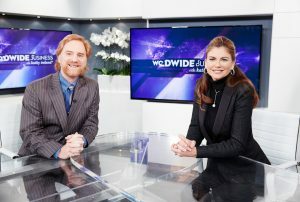 Securalert is honored to announce that we have been granted an exclusive interview with kathy ireland® and Worldwide Business. On the show, Nordicom’s CEO, Luc Harbour, will present the SecurAlert panic button technology that his company manufactures. This staff duress system is an innovative offering that combines the best available technologies in order to create the highest-performing staff duress system on the market while addressing all the challenges that such a system faces. Say you are the owner of a large hotel. You have hundreds of rooms on multiple floors. If a housekeeping staff member encounters an emergency and presses her personal panic button, how will you find her? It won’t do your security response team much good if all they know is that she is 25 feet from the west wall. It also won’t work if the panic button depends on wifi and it just so happens that it’s a peak consumption moment and the signal doesn’t go through. Furthermore, it would be a shame if the employee pressed the button multiple times, not knowing that its battery was dead and the unit wasn’t responding. The SecurAlert panic button technology solves all these problems and harnesses the whole gamut of technological capabilities in order to bring to the market a panic button technology that works seamlessly and follows best practices. The panic button system utilizes a radio and/or ultrasonic signal, not a wifi signal, reducing the chances that interference will result in the signal not getting through. When someone presses the button on their personal transmitter in any room, that room’s receiver takes the signal and communicates it to the main control panel. This allows your emergency response team to know with pinpoint accuracy the exact room where the incident is taking place. When an alert goes out, the SecurAlert system can be configured to trigger notifications to cell phones, emails, or paging systems. It can also be integrated with components like strobe lights and sirens to indicate an emergency. One obstacle to many people to implementing a panic button security system is the perceived hassle that it seems like it will involve. However, the SecurAlert solves even this dilemma with battery-powered units that last for an average of 5-7 years and can be installed with two screws in each room in about four minutes. In this segment with Worldwide Business, Mr. Harbour will also be covering some of the industries and institutions who stand to receive particular benefit from implementing a staff duress alarm system. Nordicom is proud to introduce to the Bloomberg International audience the panic button technology that has been successfully serving the industry for nearly 20 years. It is our passion to create safer environments with wireless alarm systems, offering companies the chance to give their employees greater peace of mind and security at work. Please tune in to Bloomberg International on Saturday, June 24, 2017 at 7:00 AM GMT to hear this episode.